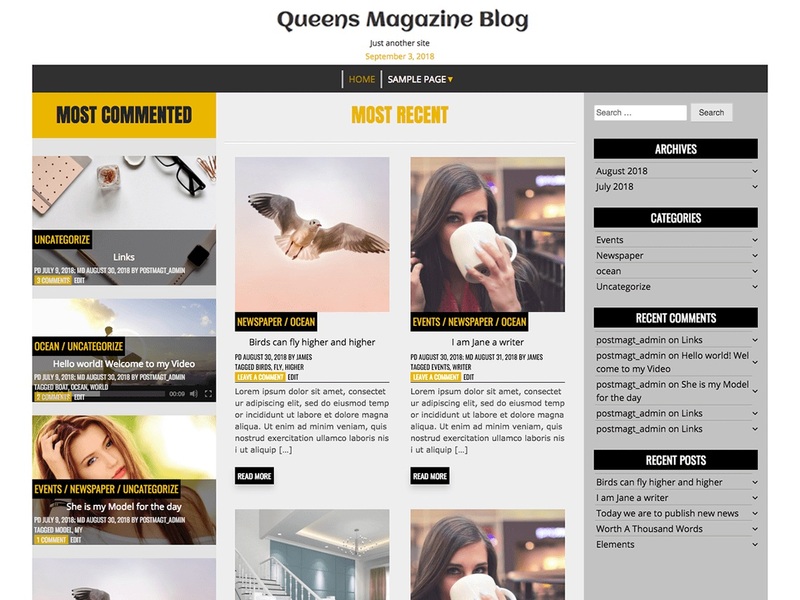 QUEENS magazine blog is an utmost user-friendly blog theme for beginners which require just installation. It only uses WordPress inbuilt widget and thus no need any user widget setting. It is fully responsive, with three columns, three sections including most recent, most comments and recent update post blog theme. It has 4 sidebars and 3 footer sidebars as default. Color setting for the site title, tagline and theme color has been provided. You can also create a video post thus showing video thumbnail. It supports embed, iframe, youtube and video tag for such purpose. Just install, activate Queens magazine blog and there you go with a pre-configured setting as shown in the screenshot. Buy pro-version for optimizing fonts and color with more widgets. Queens magazine blog is blogging for all by them all. The emergence and growth of blogs coincided with the advent of web publishing tools that facilitated the posting of content by non-technical users having less experience with HTML or computer programming, can find WordPress theme “Queens magazine blog” as an excellent tool.